Last month, I was lucky enough to be invited to the preview of the Close Knit exhibition, at Hull Maritime Museum. The exhibition was created by the Maritime Museum in partnership with the Moray Firth Gansey Project and Hull School of Art & Design. ‘Close Knit”s star turn is a gansey once owned by Poet Laureate, Cecil Day Lewis then, later, by his son Daniel Day Lewis. The gansey has since been recreated for Mr Day Lewis by the folk at Flamborough Marine. What we have on display in Hull is the original gansey. Many of the ganseys on display are stunningly beautiful Scottish ones from the Moray Firth folk, augmented with some local ganseys lent to the exhibition by the Hull Keel & Sloop Preservation Society and my own sons’ Humber Star, ‘Sunk Island’, named after a place in the Humber Estuary where my fishermen ancestors hailed from. I was more than a little star-struck to find my little gansey had somehow been put near the famous Frank Meadow Sutcliffe photo of lifeboatman Harry Freeman. It’s a great exhibition for any textile or knitting people – having not only traditional ganseys but also contemporary textile and knitwear designs inspired by them, with catwalk/runway style work by Di Gilpin and Alison Casserly. And more interesting old and new ganseys on display than you can shake a (knitting) stick at. Also a display case full of 19thC knitting sticks. One spectacular contemporary design is by Alison Casserly. Alison has a workshop at The Old Tile Works, Barton-on-Humber, where she runs work-shops, dyes yarns and designs knitwear. I’m hoping to help out with a natural dyeing work-shop very soon, so keep an eye on Alison’s web-site for details! I felt privileged, being asked to help with the ‘Close Knit’ exhibition. If you go, check out the final info board on gansey myths and superstitions – that one is mine! The exhibition will run Saturday 2nd August to Sunday 24th November. If planning a day out in Hull, I’d also highly recommend the Wilberforce House Museum – not to be missed. 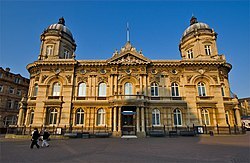 Admission to Hull Museums is free. Images above,in this post courtesy of Alison Casserly.